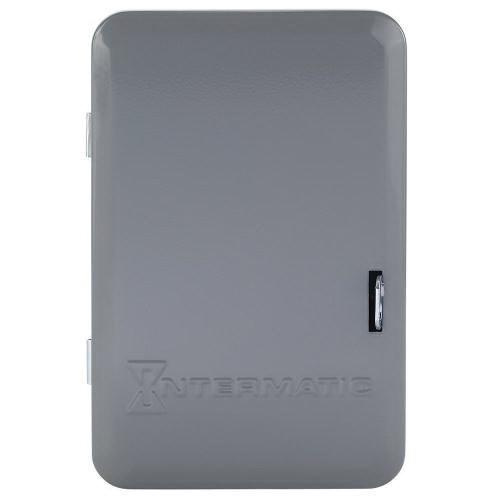 Intermatic T170 Series 1-Pole Mechanical time switch in gray color, is rated at 40-Amps and 120-Volt AC. It features On/Off action and SPST contact configuration to provide maximum conductivity. This switch accommodates wire of size 14 - 8-AWG. It has timing range of 24 hours. It has contact rating of 40-Amps at 120 - 480-Volt AC resistive, 40-Amps tungsten, 1000 VA at 120 - 277-Volt AC pilot-duty, 16-Amps at 277-Volt AC electronic ballast. Switch has maximum breaking capacity of 2 hp, 24-Amps at 120-Volt AC and 5 hp, 28-Amps at 240-Volt AC motor (full load). It contains one On and one Off tripper and three day skipper screws. This switch is suitable for indoor/outdoor lighting, signs, filters, electric fences, fans, conveyors, pool heaters, blowers and pumps. It features Type 1 drawn steel enclosure for rugged usage and longer endurance. It measures 130.2 mm x 87.3 mm x 200 mm. Switch withstands temperature rating of -40 to 54 deg C. Switch is UL listed and CSA certified.